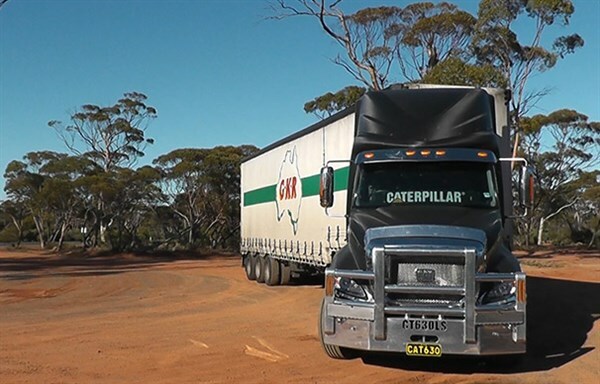 CAT’s CT630LS long wheelbase integrated sleeper cab prime mover is no stranger to these pages as I’ve previously driven it from Alice Springs to Adelaide as a double road train. 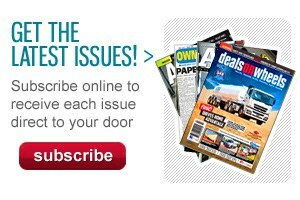 However, staying in motel rooms doesn’t give a great sense of what it is to live and work in any given truck. So, as fate would have it, a black CAT was going to cross my path again, and in a stroke of good luck rather than bad, the opportunity arose to drive the same CT630LS from Perth to Adelaide, and this time I would be not only living in the truck, but hauling and delivering a real load, almost like a real truck driver. There were however, a couple of exceptions I was going to have to make. For a start, the black prototype LS had no bunk cooler and the idea of sleeping in a matte black truck during the day at the height of summer with no sleeper cab air-conditioning seemed silly. Second, until the first production LS prime movers land in the next few months, this is the one and only LS in Oz and I’d feel pretty bad if I ran over something large, meaty and nocturnal and broke it. 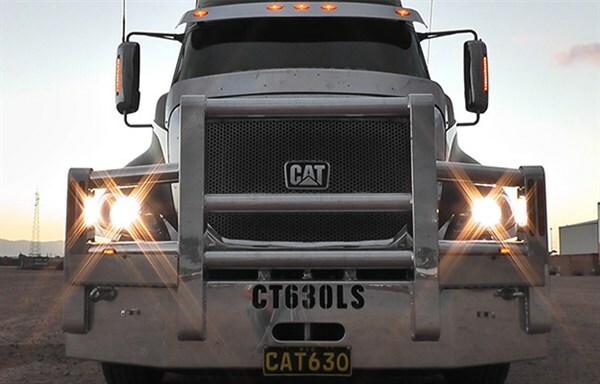 Also, I reckon the guys from CAT Trucks would probably make me walk home. As a consequence, I was going to try and knock over the bulk of the trip during the day and bunk down in the 56-inch (142cm) hi-rise sleeper of a night time. 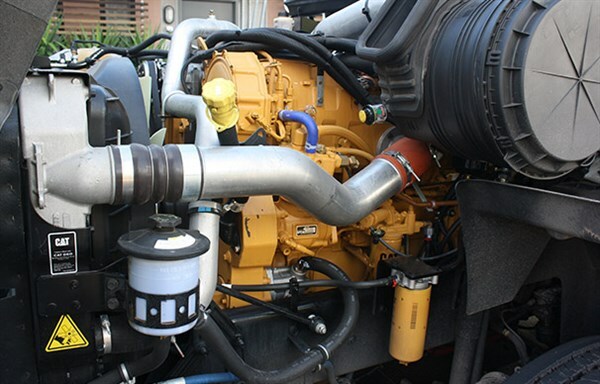 The CAT CT630LS runs a Cat C15 6-cylinder inline turbocharged and aftercooled engine with electronic direct injection with dual DPF. 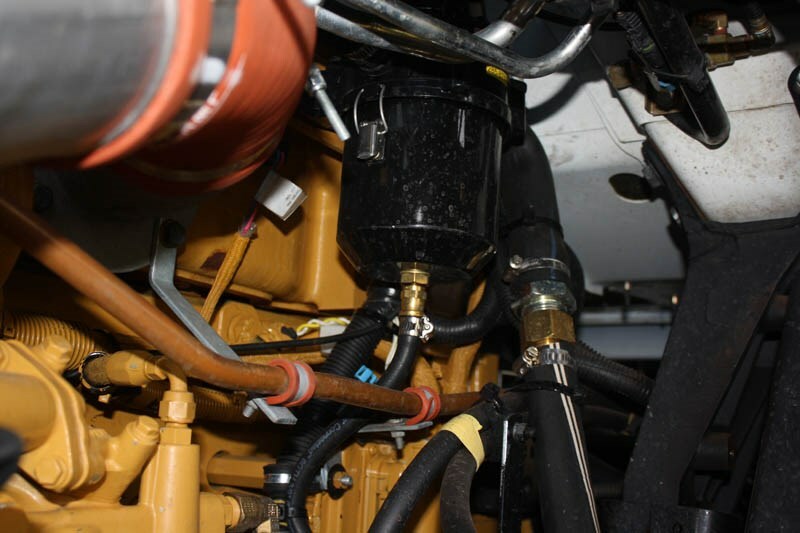 Pumping out 550hp (410kW) the CAT had more power than I needed for this trip, especially with a GCM of 90-tonnes. The big hauler is available with either an Eaton Fuller RTLO-20918B 18-speed overdrive transmission or an Eaton Ultra Shift PLUS with HAS. Stepping out of the sleeper during my test drive, I found one drawback of the LS cab: no wrap around privacy curtains — the entire cockpit was bathed in light. Standing there in my jocks, I thought "well, there goes my morning Zumba routine", because trust me, that’s something no innocent passer-by or protected native species should ever be subjected to. Another issue I noted was with the swing-up locker box doors on the LS: if you are blundering around with your eyes full of sweat and flies, the open box doors are just the right height to nearly lobotomise you. However, the LS cab gives a heap of wiggle room; the overhead storage has no fiddly doors (read: nothing to rattle) but is deep enough to keep most things within reach from the driver’s seat without danger of wearing the contents of the compartment in the rough stuff. While the interior does feel a little ‘plastic’, there wasn’t a rattle or squeak to be found, and underneath the bulging plastic panels lies a steel frame that seems to keep all parts in place effectively. From behind the wheel, the biggest criticism I could make would be the lack of knick-knack storage close to the driver, though it does remain to be seen what the production dash will include. The cup holder is handy storage, unless you want to put a cup in it of course. Speaking of space, I don’t think I’ve ever stayed in a truck cab that I haven’t had to clamber, duck or wiggle around in at some stage. In fact, the only thing I’d clocked my head on was the locker box door outside the truck. 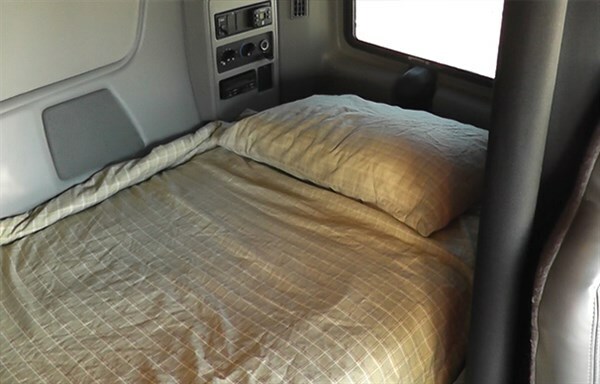 You can almost line dance your way from the driver’s seat to the bunk. 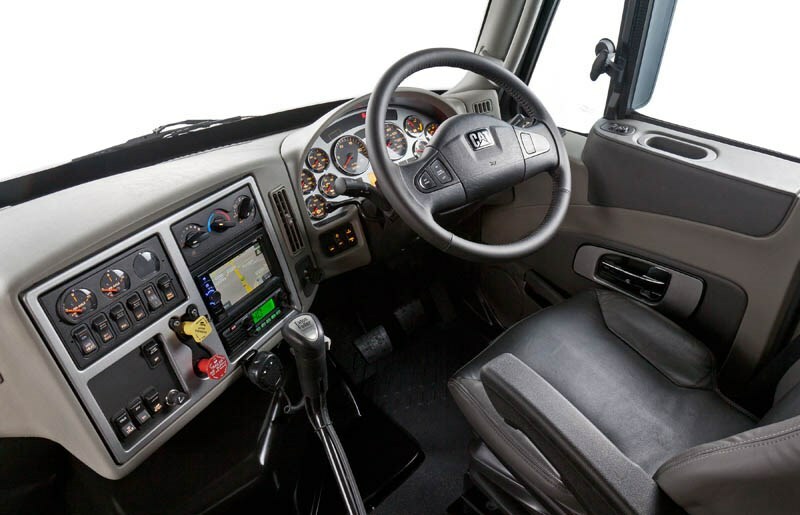 While the front lights have a way of illuminating without affecting your night vision, the same can’t be said for the overhead light in the cab, which is like staring into a search light if you use it while on the move. I arrived to pick up the black beast from Westrac’s Highway Truck Centre in Kewdale and patiently waited as the sales staff bid the prime mover, which had been over here on demo duty, a tearful farewell. With the keys to the CT630LS in my hot little hand I bob-tailed down the road to GKR Transport’s Kewdale depot to wait on my load. As is the unpredictable nature of road transport, my two-trailer load had turned into a single trailer load. As I’m by nature pretty lazy, this was going to be okay by me, but it was certainly not going to be much of a test of the C15 engine grumbling away under the swoopy bonnet of the LS. At 42.5 tonnes it was going to be like driving a big articulated go-kart. GKR had kindly organised a relatively non-urgent load of plasterboard to humour my rather leisurely schedule and even took the time out to remove the turntable chock from the trailer to accommodate the fixed turntable of my LS. While I was waiting, I loaded the under-bunk fridge with supplies for the road and made my bed. The space behind the seats was just the right size for my suitcases and all my snacks went in the storage compartments above the driver’s seat within easy reach. By the time I hooked up it was after 6pm which meant that today’s stint was going to be a relatively short one. 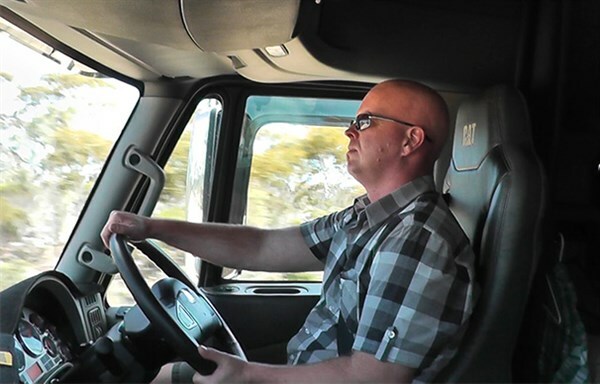 Though, before I left the depot I noticed that the clearance between the prime mover’s guards and the chassis of the drop deck tautliner trailer was pretty tight so, as I idled out onto the street, I kept an ear out for grinding and scraping, I pulled up and inspected, all seemed good so I finally hit the road. Climbing the hills out of Perth in the dying sunlight with the dual stacks of the LS singing their own special diesel tune put me in the mood for the road ahead; I was remembering the thing I liked most about this funny looking jigger — the yellow donk underneath. With a single trailer, the engine only called for full gear changes from the 18-speed road ranger ‘box’ rendering the splitter almost useless, as the torquey C15 chugged down low in the rev range before calling for a cog change. After towing quite a few multi-trailer combinations, a single trailer can almost feel twitchy on the road without the extra weight keeping things on the straight and narrow. This and the setback steer axle of the CT630 kept me correcting the wheel unnecessarily for a bit until I settled into the CAT for the long haul — kind of like a dog walking around in circles a couple of times before lying down. By midnight I found a cosy parking bay near Coolgardie to pull up for the remainder of the night. I grabbed a snack out of the overhead storage bins, closed off my log book and crawled into the well-appointed bunk for the night and — given the height of the LS’s raised roof — I even managed to do this without whacking my head on something. Day 2: Coolgardie WA to Border Village SA. Rubbing the sleep from my eyes, I finally parted the bunk curtains to take in the red dirt and scrub basking in the morning sun. I’d pretty much slept spread out like an upside down starfish, except I’m pretty sure starfish don’t drool … or do they? If they do, would we even notice? Food for thought on the long drive ahead no doubt. After a manly morning meal of Coco Pops, I made my bed, checked the tyres, woke the 15-litre from its slumber and pointed the black LS east. Then disaster struck, just short of Norseman, by the salty shores of Lake Cowan. I pulled off the road to answer the call of nature when a grinding sound came from the back of the prime mover. 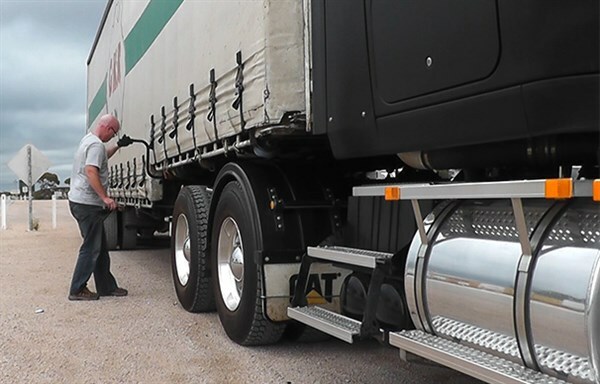 I hopped out and found that the trailer chassis was indeed too close to the guards of the prime mover; the trailer had picked up one of the outside guards, folded it over and squashed it down between the chassis and the rear left hand drive tyres … bugger. It seems that the turntable on the LS was just that little bit too far forward for the drop deck tautliner I was towing, kind of hard to point the finger on that one really. With the temperature in the high 30s and armed with nothing but a tiny, crappy, supermarket shifting spanner, I spent the next hour and a half inventing new swear words along with 3,500 of my closest friends (bush flies) as I attempted to remove the crumpled guard from its bent brackets. After dislodging the offending item, it was time to hit the road again, with time out for a coffee and shower in Norseman. After pulling into the Caiguna Roadhouse for an ‘instant’ coffee break, I noticed something quite interesting about the aerodynamics of the LS. The cabover I was parked next to was absolutely bug splattered — the front of the truck resembled a crusty safari pizza with the lot. I then looked at the windscreen of the CAT, some bug splatter yes, but nothing major. I then looked at the side of the LS, there was bug guts up the mirror housings, and streaked down the side of the sleeper. One of CAT’s excuses for making such a funny looking truck has been aerodynamics; the rounded, droopy shape of the CT630 has been designed to push air around the sides of the prime mover as well as over the top. Okay, I had a bit of a tail wind but the bloke in the cabover beside me was heading in the same direction; it seemed to me this was maybe a bit of a real world demonstration of the streamlined feline’s aerodynamic credentials. That evening, I passed a sign that read Madura Pass. As the engine brake cackled contentedly on the descent, the view south across the plain was one of those rare magical moments you have in trucking as the moonlight picked out the stark silhouette of every tree that dotted the glowing expanse of landscape below; maybe I should be writing country music songs. Soon enough I idled into Border Village, pulled the yellow maxi brake button and, after filling out the appropriate paperwork, silenced the C15 for the night. 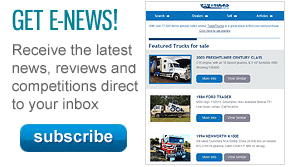 The CAT range now uses the Navistar Prostar platform as its basis for both the CT610 and CT630. While parent company Navistar may be currently battling significant economic challenges at home, the Prostar itself has been a big seller for the company, which, according to figures released by Navistar, was the top selling heavy-duty across the United States and Canada from 2008 to 2010. Studying my surrounds after a day and a half in the saddle, it’s easy to see why. 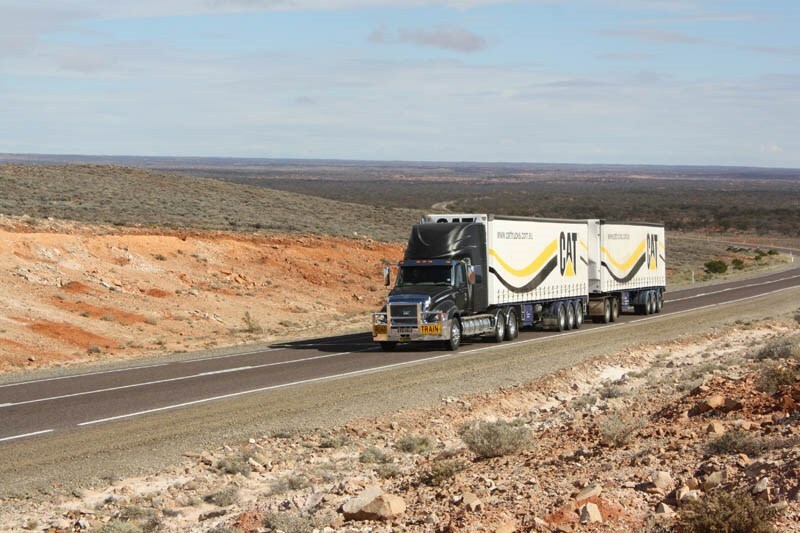 Day 3: Border Village South Australia to Port Augusta SA (has CAT will travel). After a morning feed out of the LS’s under-bunk fridge, I attempted to get rolling. I say attempted because as I turned out of the parking bay, the trailer picked up the remaining drive wheel mud guard and squashed it against the tyres. Time to break out the trusty shifter again, although this time I was prepared, I’d bought some cheap spanners along the road just in case. Pity I bought metric instead of imperial, though. With the last guard removed, I set off along the edge of the Great Australian Bight with a coastal drizzle settling on the windscreen to match my mood. The sun made an appearance as I passed the Nullarbor Roadhouse giving me a clear view of … nothing; a flat-lining horizon that makes you wonder what those early European explorers were thinking when they first thought to wander around out here getting sunburnt. A fuel stop in Ceduna saw the return of phone service. For some reason it didn’t occur to me that CAT may start to get a bit nervous about me disappearing for a couple of days in their truck without any phone contact so when contact was made it also meant I had to fess up about the mud guards. As the afternoon drew to a close over the freshly stripped wheat fields of the Eyre Peninsula, I flicked on the LS’s LED headlights, which picked out the darkening road ahead quite nicely. 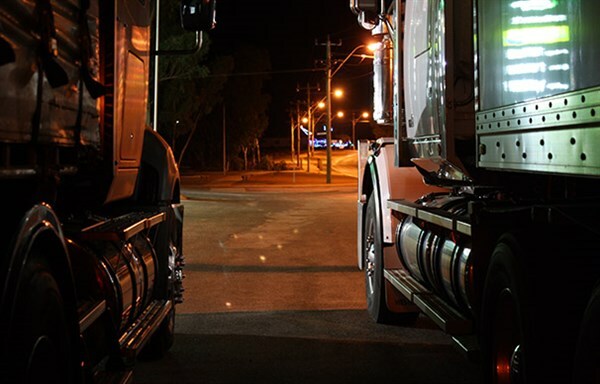 The flat white beam of the lights, especially on high beam, have a way of illuminating without affecting your night vision over long periods. DAY 4: Port Augusta SA to Regency Park SA (strolling into town). People of the world rejoice — Port Wakefield has an espresso machine. I think I was freaking the lady behind the counter out a little bit with my fixed stare and nervous jitters until I had a double shot latte in my grasp (note to self: muttering "my precious" under my breath in public is not endearing). The three-hour run into Adelaide gave me the chance to ponder on the CT630LS. There’s an almost refreshing honesty about the CT630 and the LS is no exception. 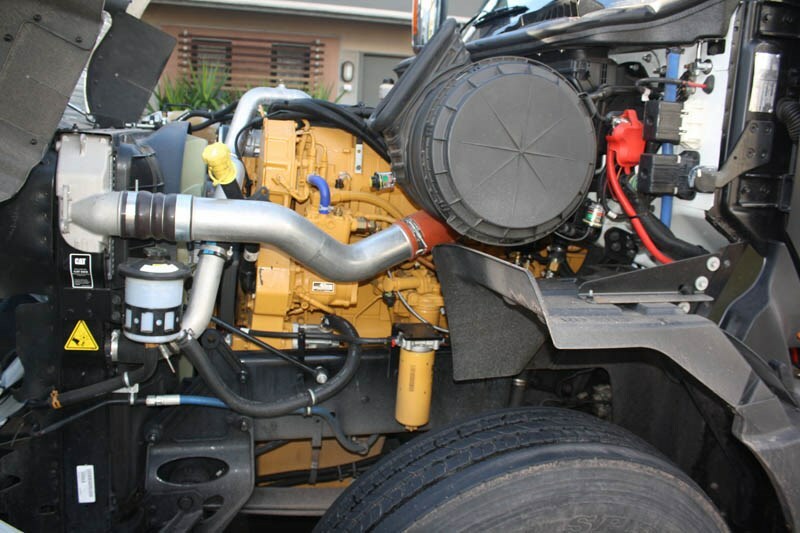 In making the C15 ADR 80/03 compliant, CAT has managed to avoid the complexity of exhaust gas recirculation and selective catalytic reduction and in doing so have retained a feel and driveability all but gone from the Australian trucking landscape, the CT630 is a pleasantly engaging beast to drive. Also, the Navistar cab rounds the vehicle out nicely providing enough room inside to (bad pun alert) swing a cat, in what amounts to quite a lightweight aerodynamic package. In fact the biggest deficit I can see is the GCM of 90,000kg. If CAT can bump that up to 120,000kg or more, they really will have a vehicle that makes the most of the drivetrain’s capabilities.